Trust Nigerian prophets, every new year, we get to hear something from them. Just this past year, Prophet TB Joshua prophesied that the Chibok girls will be released unharmed, this is 2015 and there is nothing of such. The same prophet predicted that the missing Malaysian airline will be found and it never came to pass. 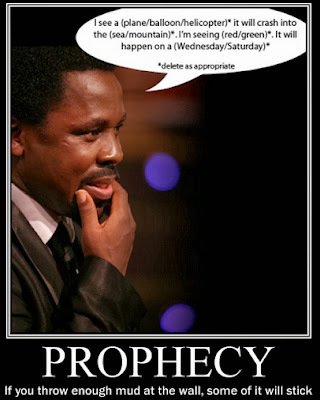 Without much ado, here is a list of unfulfilled prophecies revealed by Nigerian Prophets in 2014. Popular Pastor Temitope Joshua, the General Overseer of the Synagogue Church of All Nations in a two-minute, 55 seconds video clip on prophesied that the missing Chibok Girls will return unharmed but did they? “Unless I’m not called by God, I place my career and calling on the line that these 200 schoolchildren and girls that were kidnapped have to be released immediately, unharmed and unhurt.” He said on May 3, 2014, seven months ago…we still await their release. Also on March 15, 2014, the Prophet preidcted that the missing Malaysian Airlines Flight MH370 would be found. “There is a big controversy going on in the world about the missing Malaysian plane. They don’t know where the plane is. I’m the only minister, if not only me, that God used to speak about this issue. But the whole thing is coming to an end. The whole thing has come to an end, in the sense that they would discover the plane, they would discover the particles, everything would end any moment from now. So, this coming week, we are not going to be talking about it again, rather the families concerned would know their fate.” – The Malaysian plane is yet to be found. In August 2014, this same Prophet declared that Ebola would be a ‘write-off’. “People of Liberia, Sierra Leone and Guinea are released. The whole thing is (a) write-off. The life we have been living before now, we are back to that (sic).” – Ebola is still active in Guinea, Liberia, and Sierra Leone. On August 29, 2014, the UK’s Joint Terrorism Analysis Centre changed the UK threat level from international terrorism from substantial to severe. Two days later, Joshua predicted a terror attack in the UK sometime between the middle and end of September.” However, no terror attack was launched on the UK in the said year. Theophilus Olabayo, predicted late 2013 that Osun State Governor, Rauf Aregbesola risked being kidnapped in the New Year of 2014. “Governor Rauf Aregbesola of Osun State has to be watchful so that they will not kidnap and kill him in the New Year. He has to be very careful so that he can survive the year.” But nah, the Governor is still alive and no attempt to kidnap him was recorded. Akiode Olusegun, General Overseer of the Ogun State-based Divine Ministries International, said 2014 would be a year of economic surplus for Nigeria. “2014 is a year of economic growth for Nigeria.’’ – what economic growth did Nigeria experience? Apostle Johnson Suleiman, who is the founder and Senior Pastor of Omega Fire Ministries Worldwide, said the contest for the presidential ticket to select the individual who would be the standard-bearer of the All Progressives Congress for next month’s election would split the party – but when Muhammadu Buhari was chosen, nothing of such happened. I saw a colonel in the military trying to stage a coup but he will fail.’’ but it did not come to pass too. CBN and new notes: “I see CBN printing high denomination naira notes this year,’’ also never materialised in 2014. “Nigeria will perform exceedingly well in this year’s World Cup but the Super Eagles will not win the cup. This is how the breakdown of how the game will look like: The Iranian team will either draw with Nigeria or place the Super Eagles in a qualifying state on the game to be played on June 16, 2014. Then, Nigeria will record impressive victory against Bosnia and Herzegovina on June 21 and another victory against the Argentina team on June 25.”…unfortunately, 2014 World Cup outing has been the worst for Nigeria. Nigeria crashed out after losing 0-2 to France in the second round. Although they played a goalless draw with Iran and won only one match, a 1-0 win against Bosnia and Herzegovina, the Eagles lost 3-2 to Argentina in the group stages. Politics: “I see Atiku Abubakar, the former Vice-President under Obasanjo, taken captive with the unfortunate politicians to suffer and possibly die over the coming crisis in the country. He will, however, be saved miraculously from the pangs of death and torture. A dirty slap on the face of Tb joshua. What other confirmation do we need from God to conclude that u’re not sent. Thank you so much for keeping track record of these fake Pastors. They vomit rubbish and lying against God. These rogues have been deceiving people by telling them that we heal sick, restore the blind, Lame walking, deaf can hear. How many times have they visited Kano street or LASUTH to heal sick people. Their miracles can be performed inside their churches only where they have planted some mischievous people to stage the miracles. Jesus, when he was alive he used to walk around to heal people not limiting himself to a spot and ask people to bring their fortune in order to get bless. My brother you are so right. I thoughts about this issue last week with my friends! I’m happy as this sweet news comes out! Let the world know that kind of men of god who want to destroy our Nigeria with fake predictions not prophecies! I love Nigeria! let us watching them with they predictions! Some will start close mouths! What about their predictions that actually came to pass. These men are humans for crying out loud. They make mistakes too. If someone makes up to about 60 predictions of prophecies and only 2 failed is he fake? Why do Nigerians like to major on people’s mistakes. Who are you to judge another man’s servant anyway. This I know, Devil is longer using gentile to accuse brethren the majority of the people helping satan to achieve his purpose of accusations on brethren are Christians. We love to hear bad news about men of God, we publish thier error and we ignore thier strength. We pay close attention to thier mistake and we are happy whenever thier in errors. We have forgotten the only thing the Bible says we should do for them is to pray for them. The bible also say whatsoever thing that are good, honest good report and so many other good thing is what we should be thinking about not only to ourself but to others. If we are judge with the measure of judgment we pass unto them hm we know the what will follow. So let be careful. ****** if i may ask who make u a judge here, or as the saying thou shall nt judge as been remove from ur bible? I belive if tb joshua were to be a white man we travel from far lenth just see him and pay any amout of money just to recieve intructions from him. We recieve Renhard bonky just becoz he is from another country.